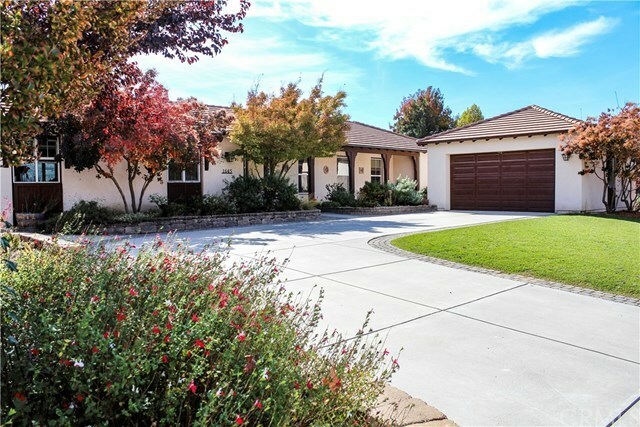 Welcome to your beautiful home in one of the most sought after neighborhoods in the desirable Templeton School District! 1645 Via Rojas is located in The Vineyards, an upscale neighborhood with quiet cul-de-sacs, side walks & harkens back to a time when the pace of life allowed time for getting to know your neighbors! As soon as you step inside you will have your breath taken away by the stunning views overlooking the Santa Rita creek & gorgeous oak forest! The open concept floor plan & well thought out design offers you mesmerizing views from the kitchen, living room, all of the bedrooms and bathrooms and even the laundry room! The kitchen offers you granite counters, a grand center island, pantry, attractive solid maple cabinetry, hardwood floors & has been updated with Kitchenaid Stainless Steel appliances too! Off the kitchen is a separate laundry room with cabinets, sink & a glass exit door overlooking the view! The Living room is open to the kitchen & dining room & offers a cozy gas fireplace, picture windows & a glass door leading out to your covered patio, expansive lawn, gorgeous fountain & incredible views! There is a dog run for your convenience and the property is privacy fenced on the sides & offers rod-iron view fencing at the rear with a green belt for privacy along the back! The 3 bedrooms all face the back yard & the master suite offers a huge walk in closet, soaking tub, dual sinks, separate tub & shower & slider to the back yard! Call today for a tour!